The Rexel Prostyle Plus 12 Sheet Shredder has a P-3 security rating, meaning it can be used to shred highly confidential documents. It will shred an A4 sheet into approximately 200 4 x 35mm pieces. The 20 litre bin will hold up to 200 sheets of shredded paper and it also has a separate CD slot and waste container – ensuring that the CD waste is kept separate from paper for recycling. In addition the Prostyle + will also shred credit cards. The shredder features a unique modern design and is suitable for either personal use or for use in a small or home office environment. Other features include a clear bin window so you know when the shredder needs empyting, a reverse function to help clear paper jams, a standby mode that gets activated after 2 minutes of non-use to save power, and the ability to shred paper clips and staples. 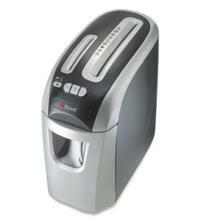 The Rexel Prostyle + was also the top rated shredder on The Gadget Show in a test of 20 leading home shredders.